Doughnut Plant’s New Inception-Style Pastry Will Light Up Your InstagramIt’s a good alternative to Thanksgiving pie. Doughnut Plant Rolls Out Pumpkin-Spice Doughnuts Topped With Actual Pumpkin BitsPlus, give a very warm welcome to what may be the world’s first mole doughnut. 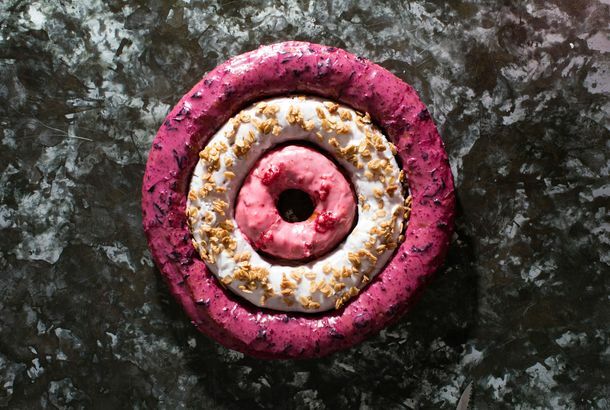 Shake Shack and Doughnut Plant Unleashed a Limited-Edition ConcreteThe limited vanilla–raspberry–sesame cake doughnut run lasts untill September 21. Doughnut Plant Said to Be Scouting Third New York LocationGlazed with excitement. Doughnuts to Colonize NYIt’ll rain sprinkles somewhere near Grand Central Terminal. Doughnut Plant LES Expands, Adds SeatingAlso, there’s a Girl Scout Cookie Locater app! Doughnut Plant GrowsPlus: a Doughnut Plant comic! Sweet Hole-y … Doughnut Plant Now Open in Chelsea!Of course, there are lines out the door. Doughnut Plant Will Open in Chelsea Hotel on Valentine’sJust in time for rose-petal doughnuts! Doughnut Plant’s Chelsea Hotel Location Is Held Up by ‘Drama’Its opening may have to wait till next year. Reader Accuses Doughnut Plant of Decaf DeceptionShe drank the doughnut shop’s coffee for a year before she found out it was decaffeinated. Country’s Best Doughnuts?The mag does a cross-country survey of doughnuts, but the Bay Area choices are a little haute for our taste. Crucial Pinkberry and Shake Shack UpdatesChocolate fro-yo and doughnut holes. Día de los Muertos Tonight at Mayahuel; Craft Debuts Farm DinnersPlus, mandatory gratuity at Cornelia Street Café, and an extended stay for Brooklyn Brewery, in our regular roundup of neighborhood food news. Fight the Valentine’s Hangover With Rose-Petal DoughnutsDoughnut Plant is making them for a limited time.